Happy Monday to you all! It's Shay here. Today I bring you a clean and simple card to celebrate a momentous occasion. Family friends are celebrating their 25th wedding anniversary soon. 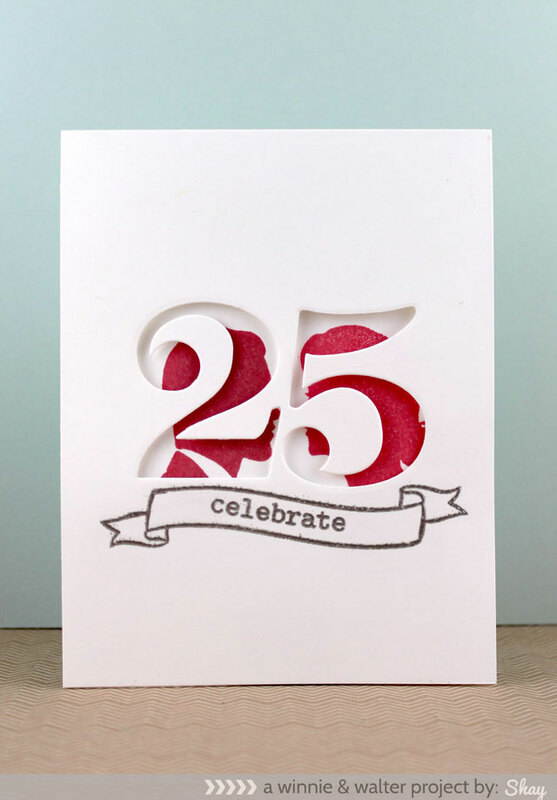 To make the design gender friendly for both recipients I went with a red, white and silver (for a silver anniversary) color scheme and kept everything graphic and streamlined. I die cut "25" with dies from Papertrey Ink and then determined the placement of the male silhouette from The Write Stuff: Leave it to Dad and female silhouette from The Write Stuff: Leave it to Mom so that the male silhouette could be seen in the "2" and the female silhouette in the "5". 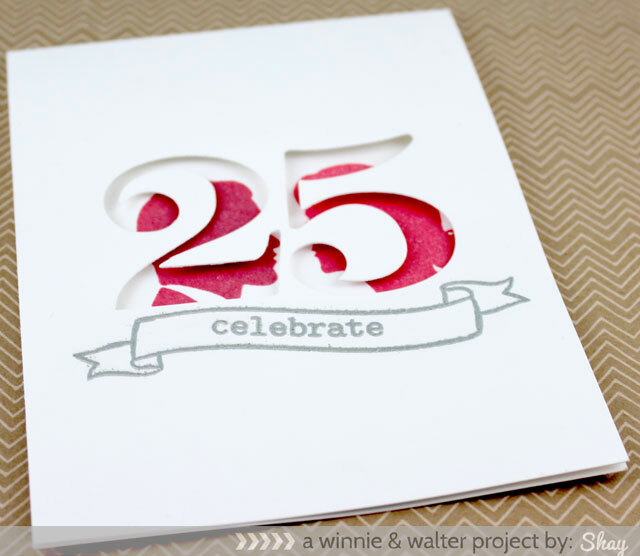 I stamped the silhouettes in pale tomato Hero Arts Shadow Ink on the inside of the card. Below the 25 on the front of the card I stamped the outline banner and "celebrate" from The Big, the Bold and Extras in Versamark and heat embossed it in silver. Inside I added the love story circle from The Write Stuff: Love Story stamping it in Versamark and heat embossing in silver. 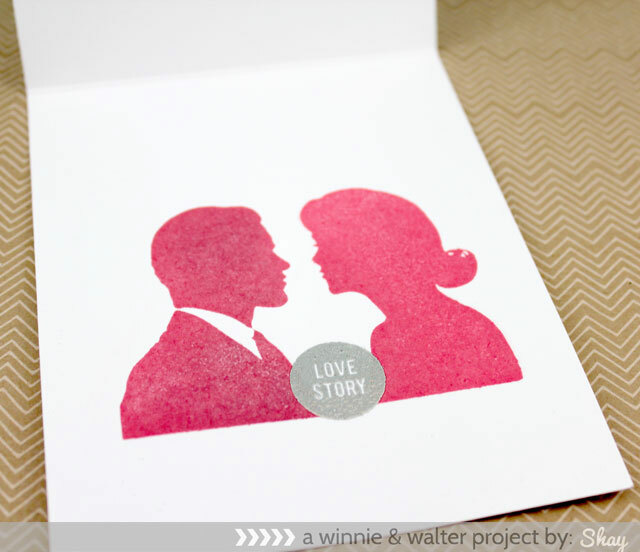 I love how these silhouettes make love, wedding and anniversary cards so easy! Change up the color scheme and/or the die for another year or even a heart and certainly add embellishments to make personalized love cards for your recipients. Come back Wednesday to find out who won during our Share the Love Week featuring Tim Holtz Distress Ink by Ranger. Hope this Monday is a beginning of a craft-filled week! What a great card, Shay! Love your design for this special occasion! This is one cool design, love it!! Very cute idea to create a window with the picture and have the silhouettes posititoned behind it! Very clever - great design! Really amazing, the silhouette behind the die cut number is genius, LOVE! Stunning card Shay - such a clever idea! Love the combination of stamps. absolutely amazing Shay. Great graphic design. this card is pretty amazing. pinning!